WordPress is a great SEO friendly platform but for better search engine visibility you need to optimize each and every post or page you publish online. In this post, you will learn what is the difference between a WordPress post and page when it comes to SEO and how to optimize both using industry best standards and practices. What is the difference between a WordPress post or Page? Pages are mostly used for the static content of a website and are not part of WordPress’s blog content loop. In other words, if you add a new page on your website it will not appear in your main blog page or in your latest posts widget. Pages by default do not have the option to add them to categories. Pages are mostly used for ‘about us’, ‘contact us’ and any other pages of the website that are not posts i.e. landing pages. Pages can be based on different templates (meaning they can have a different design), while posts are all based on the same template so they have the same design and structure. SEO wise there is no difference. A page or post can rank high in the SERPS if is has the right content and is optimized properly. Some people argue that pages have an advantage but taking a closer look at the top results in Google search (for any keyword you want), proves otherwise. What is the best practice, should you use posts or pages? The simpler approach is always the better. Use posts for your blog (articles, news, announcements, product reviews etc.) and pages for all your other content. Before doing SEO for your posts or pages, you should review and make sure that your homepage is optimized. This is important especially for corporate websites or ecommerce stores since the home page can give a lot of information to search engines about the website and its purpose. This also has an impact on the SEO performance of the other pages on your website. So, once you get homepage SEO correct, you can proceed with optimizing your posts and pages. 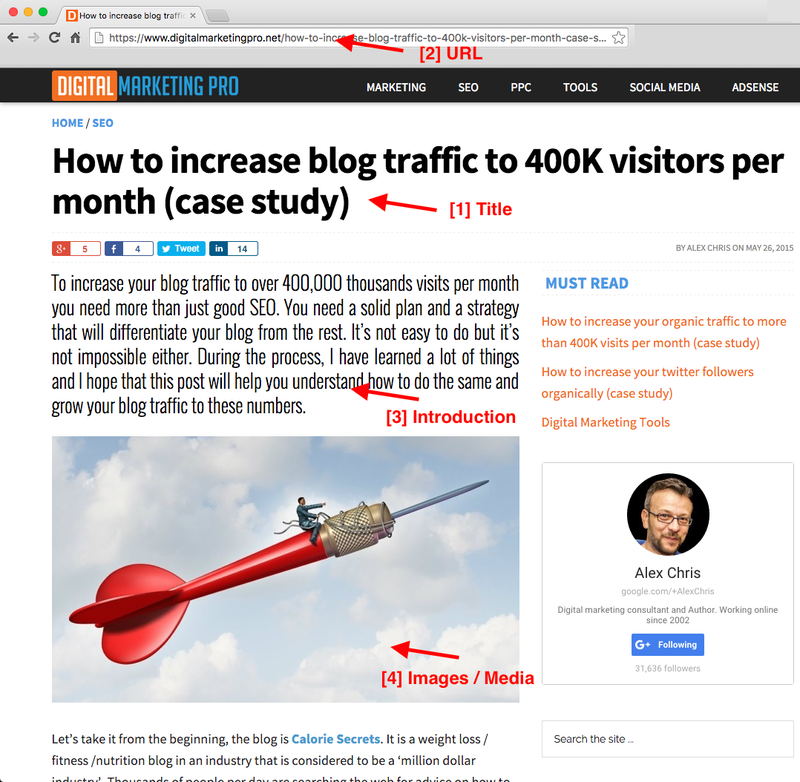 There are a number of elements that need attention and I will demonstrate this using one of my posts (How to increase blog traffic to 400K visitors per month) as an example. The title of a page or post comes first. It is one of the most important on-page SEO factors of anything that is published online. Search engines while crawling a page, they search the HTML code to find and interpret the <title> tag. What they find in the title is a strong signal on what the page is about. Of course there are many other signals that are part of their ranking algorithms but the title plays a prominent role. Length of a good title is between 45 – 60 characters. The title should not be too short i.e. only a couple of words and also not over 60 characters since search engines show about 60 characters in the SERPS. The title should be catchy and promising. This is what user’s will see in the search results and if the title is not interesting they won’t click even if your page appears in the top positions. The title should accurately describe the page content. In your effort to make your title interesting don’t overdo it by providing for a title that is not backed up by the page content. Remember that your goal is to optimize the page for search engines and not just to crab user’s attention. Consistency in the title and content is necessary for SEO success. Add keywords in your title. This is also necessary and important. When writing your title think what keywords are relevant to the page content and what keywords users may type in the search box. Have in mind that the title of a post (or page) may be slightly different than the <title> tag of a page. 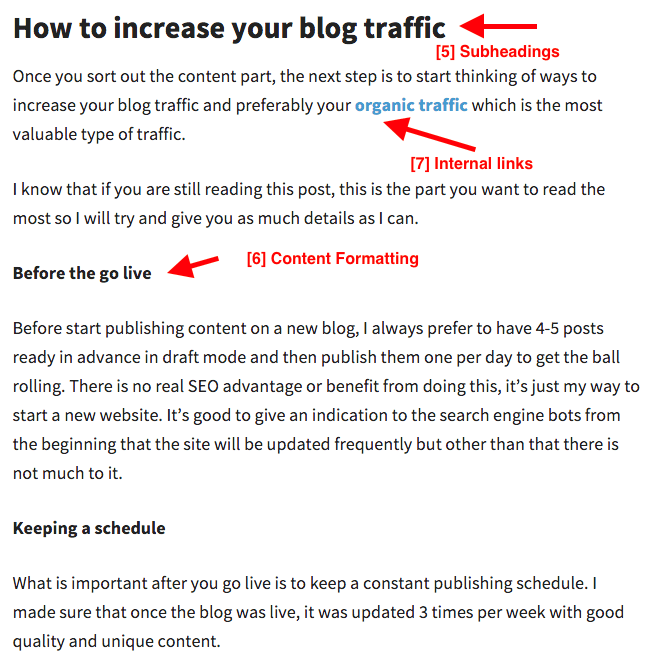 If you notice in the example above, the title of my post is “How to increase blog traffic to 400K visitors per month (case study)” which is 69 characters. The value of my <title> tag though is 56 characters “How to increase blog traffic to 400K visitors per month”. I have done this so that my title length is within the accepted character limit but at the same time to make it more interesting by adding the words ‘case study’. This is a valid technique and you can do this by providing for a custom title using either your theme SEO settings or Yoast SEO plugin. A very good example on how to approach your title is given by Google Adsense. If you closely examine the title used by Adsense on their homepage, you will notice that the first 50 characters of the title don’t mention the brand i.e. ‘Google’ or ‘Adsense’ but it includes several keywords like ‘make money online’ and ‘website monetization’. In my introduction to WordPress SEO, I have explained in details how to setup your permanent link structure in WordPress. If you have already done this, then there is nothing more you need to do. If you are on a different platform, then you need to make sure that the URL of your post or page is meaningful and has words separated by ‘-‘. Note: In cases where your website is available in different languages then it is preferable to have your URLS in the same language as the content of the page. You have text content right below the title. (notice how I moved the image to appear below the first paragraph of the article). The first couple of lines of text accurately describe the page, include keywords and are also consistent with the page title. Think of this like a summary of the page and a way to tell search engines (and users) in a few words what the page is about. 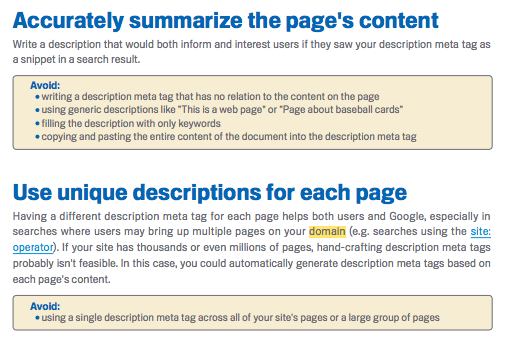 You can use the first 150 characters of your introduction as the <meta description> tag of the page as well. Too many media elements increase the loading time of a website and this is not good especially for mobile users. If you have videos, then upload them in a streaming video service like YouTube or Amazon WES and embed them in your website. Hosting the videos on your own server is not a good idea. Use ALT Text for images and the proper schemas for Videos. It is proven that long blog posts (over 1500 words) perform better in SEO. On the other hand, this means that pages become longer and more difficult to read. To keep your readers interested in your content you should try and break down your posts into sections and use subheadings to describe each section. Subheadings are good for SEO and also useful for people who use skimming when reading. Approach the structure of your page in the same way you would approach the setup of a ‘table of contents’ for a book. The page titles are your book chapters and the subheadings of a page are the chapter contents. In terms of technical SEO, the page title should have the <H1> tag (and you should only have one H1 per page) and the subheadings can be <H2> or <H3>. Besides subheadings, make use of other formatting options to make your pages more appealing to the eye. Things like bold text, italics and small paragraphs help in beautifying a page. Many people think that this is not very important because search engine crawlers cannot really ‘see’ a page like a human but this is wrong. Crawlers are able to tell if formatting work has been done on the page but most important of all, don’t forget that the user experience is what it matters most and this is where you should concentrate all your efforts. Make your users happy so that they spend more time on your page, engage with your content and come back for more. One of the most powerful tools you have in your disposal when optimizing a page for SEO are internal links. Internal links are simply links pointing to pages (or posts) on the same domain. First, they give users an easy way to read more about a certain topic. Second, they act as pointers to search engines so that they crawl and discover more pages from your website. Third the anchor text of the internal links is used by search engines as a ‘guide’ on what the linking page is about. Fourth, it’s a great way to make search engines differentiate the important pages of your website from the rest. 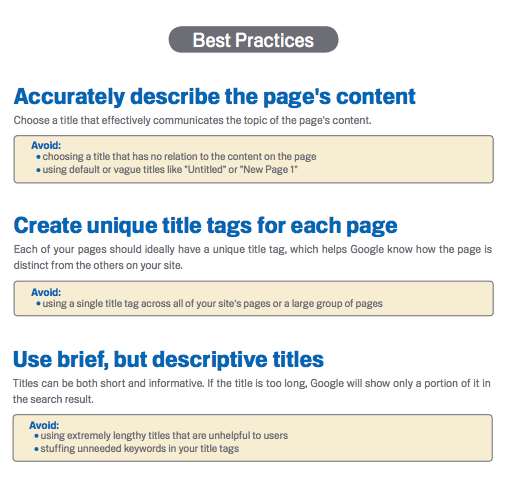 This is useful in cases you want to improve the ranking of a page for specific keywords. Use internal links only when they are useful for users. Don’t just add internal links for the sake of having links to a page. Don’t be afraid to have keywords in your anchor text for internal links. Google will not penalize you. See below what they recommend in one of the SEO Guides. Vary the anchor text. While as mentioned above it is ok to use optimized anchor text for your links, don’t overdo it but try to vary the anchor text. As a general rule of thumb, over optimization is never good. Don’t just link to old posts from new posts but try to go back and edit older posts and add links to newer posts. So far in the process I have described the technical SEO aspects of optimizing a page or post but this should not in any way reduce the importance of the actual page content. Make no mistake, the quality of the content is the biggest SEO factor of all. I have said it many times in the past: a website with great content will perform good in search rankings with or without SEO. A website with great content and good SEO will perform great in search. In it’s simplest form, good content is what users want to read. Search engines have become so intelligent in the way they interpret user behavior and they can identify what users like and what they don’t. Google’s recent addition to the ranking algorithm (RankBrain), is the proof that machines are able to understand and satisfy user intent. When a user types something in the Google search box, their sophisticated algorithm will return the best possible results to keep that user happy. From a publisher perspective, how can you create content that will make your readers (and search engines) happy? Unique Content – Any content you publish on your website has to be unique. Unique means that it’s not an exact copy of something that is already published on-line. Take for example the post you are reading now, if you search Google for “How to SEO your wordpress posts”, you will get hundreds of pages that talk about the same topic, yet this post is unique and original. Fresh – People like to read up-to-date content and search engines want to offer their users the latest information about a topic so updating your website frequently with new content is a critical part of SEO. Content should be long enough to grab the attention of both users and bots – Various studies have shown that long detailed content performs better in search and is also shared more frequently in social media. Websites that consistently publish long articles (more than 1500 words) have experienced more growth in organic traffic than websites who published shorter articles. What is the relationship between content and optimizing your WordPress posts and pages? Part of the on-page optimization process is to review your page or post content and make sure that is has the characteristics specified above i.e. that is unique, fresh and long enough (depending on the nature of your website). Structured data is good for SEO. As explained in a previous post, structured data can improve the way your website is shown in the search results and this has a number of benefits. When optimizing your WordPress posts or pages, you need to make sure that the relevant schema is implemented in your pages. No SEO optimization guide is complete without mentioning the importance of incoming links. Links pointing to a website or webpage are considered by search engines as ‘votes of trust’ and this works in a positive way when it comes to achieving higher rankings. Word of caution: Many webmasters don’t give the necessary attention to links and either they don’t go after links and their rankings are not improving or they cross the thin line and do more than it is allowed and get into trouble (think Google Penalties). Link building is a huge topic and something that I will cover in more details in a new post but it is worth mentioning here the basic guidelines of link building. A good link is one that Is coming from a related website and is trusted by Google. This immediately excludes purchased links, links exchanges, links from blog networks, links from article directories, low quality forums, spam comments and anything else that does not provide good control on how links are given. It may sound cliché but the only safe way to approach link building is to reach out to people that may be interested in linking to your content. You can get to them either by targeting them in social media (through paid advertising) or by connecting with them via email. The general idea is that you need to get your content in front of the people that are likely to naturally link to it. When optimizing your WordPress posts or pages make sure that you analyze all the components that are part of a page or post. This includes your title, description, URL structure, content and media elements. Once you are confident that you got the on-page SEO correct, then you can start thinking on how to promote your content for the purpose of getting links from other websites. Do some research and find out who is more likely to be interested in your content and try to get your pages in front of their screen. If you have good content, you will get the links and everything will become easier. this is useful to me. quite informative and well guiding. there are terms I need to still digest though. I still don’t get it about links. Great. Thanks for sharing . It will certainly help SEO professionals. Nice to read article and it shows easy – to – manage points for increasing visibility of websites. Keeping the content fresh and unique is also a key factor. Thanks Alex! That’s a good resource for beginners. Most of it focuses on general SEO tips, applicable to non-Wordpress sites as well. So could u please also write an article specific to WordPress plugins which may assist in implementing these SEO techniques? Thanks Alex for the Effective Article ! It’s really very helpful for my website !